So everyone around you know that you are an environmentally friendly person, but what they do not know is how far you will go to make sure that there is still a planet for our descendants to inherit – and this has caused you to part with $12.99 so that you will be able to bring home the My ECO Can. Just what the heck is My ECO Can? For starters, this is a new, eco-friendly, portable and reusable drinking bottle – so you need not worry about nasty plastic or paper cups being used at the next office party, as you will tote around your own drinking apparatus. 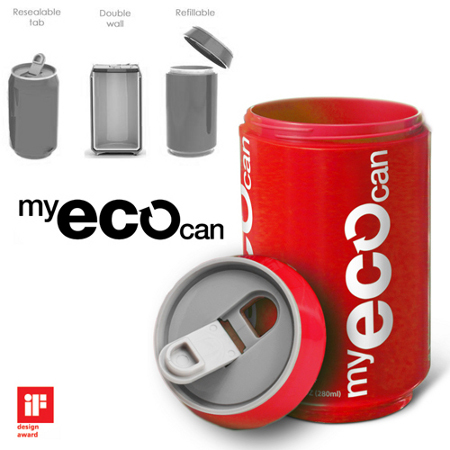 To make it less shameful for you (assuming you’re rather reserved in terms of character), the My ECO Can will come disguised in the shape of a soda can. Needless to say, this is a biodegradable product being made from natural corn starch, and is microwave and dishwasher friendly – not to mention leak proof to boot!